Nobody in the history of film will be remembered as the iconic Dracula more than Bela Lugosi. Originally from what is now Lugoj, Romania, Lugosi started acting in Europe in the early 1900s, served in the Austro-Hungarian Army during World War I, then emigrated to the United States in 1920. While the actor played various roles in silent films in the years that followed, his iconic role began in 1927 as the star of the Broadway production of Bram Stoker's Dracula. The play was a success and ran for 261 performances on Broadway before going out on tour. When Universal Pictures decided to produce a film version of Dracula in 1930, the producers were trying to get another iconic horror film star, Lon Chaney for the role, but in the end Bela Lugosi would take his stage performance onto the silver screen and forever be the face of Dracula. 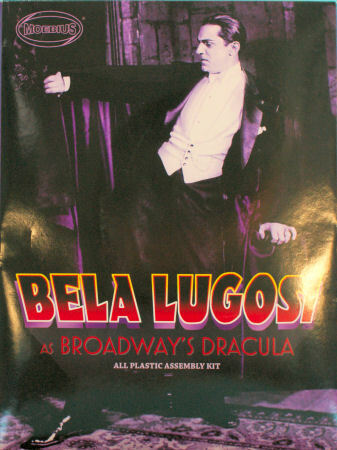 Moebius Models has produced a new kit that captures the look of Bela Lugosi as he appeared on stage as the vampire Dracula. 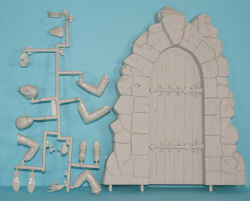 The kit is molded in light gray styrene and presented on two parts trees, plus a number of separate parts including the upper and lower torso halves, the six-piece cape, and a nice base with backdrop. Compared to the vampires on the big screen today, Lugosi's Dracula was very well-dressed in a tuxedo with a cape. 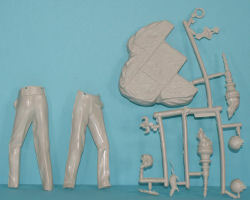 These details are nicely captured in the kit and will provide the basis for an impressive figure. Assembly is straightforward and is best built into subassemblies and painted before final assembly of the model. In contrast to the immaculately dressed Dracula, the backdrop looks like the inside of an old castle complete with torch for lighting. The backdrop is begging for heavy weathering which will make for an interesting contrast with the figure. The compulsory human skull, rat, and bat are included if you want these embellishments. This is another outstanding kit from Moebius Models and whether you're a figure modeler, film buff, or wanting something different to build, this kit is just what you're looking for.